today two remarkable and legendary figures passed away. i have the feeling that many more people know of steve jobs than rev. fred shuttlesworth. both of these men helped to greatly shape our society. i am not sure why it upsets me that not more people know of shuttlesworth’s contributions, but it does. here is rev. fred shutlesworth at a demonstration with rev. 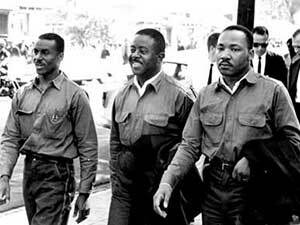 ralph abernathy (center) and rev. martin luther king, jr.
many local leaders came to national prominence for their courage in the face of oppression during the american civil rights movement. rev. shuttlesworth was one such leader. freedom rider. sit-in-er. one of the founders of the sclc. regularly put his life on the line for the movement. where would we be today without the struggles and progress made through the civil rights movement? where would the civil rights movement have gone without birmingham? where would birmingham be without shuttlesworth? similar questions can be asked about mr. jobs, for the computer that i am using to type this right now is part of a revolution that has happened (is happening?) during my lifetime, and is changing the world drastically. cynics might say that some other reverend or some other computer nerd/genius would have done whatever these giants have, but i am never sure. just like us poets are never sure who in the audience may or may not be moved by our words, we cannot be sure of our (or others’) greatness until we see it coming alive in front of us. these two gentlemen we now find dead in front of us live on through the millions of lives they have touched.